Santhoshmoni's husband died in 2010 after being stung excessively while returning from the jungle. It was a terrible shock. Sadly, Santhoshmoni had already lost her only daughter to illness when she was just 5 years old. Santhoshmoni struggles to find enough work to support herself. 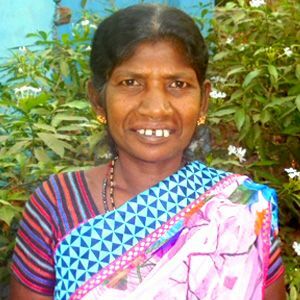 Her two sons do daily labor work and are barely able to support themselves, let alone assist Santhoshmoni. Your sponsorship will ensure that Santhoshmoni receives adequate food and good care, but most importantly, it will bring her hope.